The online news station at Consumers Reports recently wrote an article about a flexible leash severing the finger tip of a lady who tried to hang onto the flexible leash as her dog pulled her across a parking lot. A flexible leash (also known as a flex-leash or retractable leash) is a coiled up line that allows the line to go in and out very quickly as the dog’s distance from you changes. Many people like this type of leash as it allows the dog to walk out ahead of them at a varying 3-16 feet. For a dog that likes to pull and has not been trained to walk on a shorter leash, this seems like an obvious solution as now the dog has more distance to run around the person. However, it is only a temporary fix as the dog quickly learns that it can still pull but now at 16 feet instead of 4 or 6 feet. Additionally, the dog will typically run back and forth in front of the handler or worse yet run circles around the handler. The only time I have seen a plus side of using a retractable leash is while potting my dog during breaks on a long car vacation ride. By the leash retracting, I don’t have a leash that gets dirty while the dog walks through a doggie potty area nor do my feet get wet from the grass as I stand on the parking lot pavement as my dog does his business. However, when paired with the potential for serious injury and it’s just harder for the typical owner to keep control of a flexible leash than a normal leash when a dog lunges, it’s not a recommended practice. Therefore, for safety and training reasons, the use of retractable leashes is not recommended. Instead, a long line that drags on the ground while the owner holds the end of the leash can be used when doing distance work such as for a sit or down stay at a distance or a recall from a distance. And, for walking your dog, a 4 or 6 foot leash is recommended. With help from a Michigan dog training professional you can teach your dog to walk on a loose leash very quickly and avoid being potentially injured by a retractable leash. This entry was posted in Dog Training Tips, Product Review, Uncategorized and tagged dog training professional, down stay, flexi-leash, flexible leash, Michigan Dog Training, recall from distance, retractable leash, Sit Stay, walk on loose leash. Bookmark the permalink. Nice post! I do not recommend retractable leashes either. I’m torn on this issue as a pet sitter. I use both but what I use depends on the dog I’m walking & their behavior on a leash. 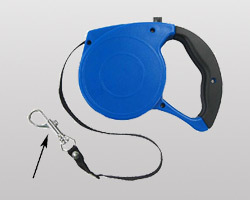 I also have a walking leash tool called “WalkaDog” http://www.walkadog.com/ – it helps train a dog to heel while on a walk & not pull. While walking down a street I prefer a old fashioned cloth leash. But if I’m in a park I’ll use a retractable leash to give the dog a bit more freedom. Thanks for commenting. Every tool has it’s pluses and minuses. But for the mentioned reasons, I do not recommend retractable leashes to my clients. It is hard for them to maintain their grip on the device if the dog lunges, it teaches the dog to pull and not be aware of their owners’ location because they are 16 feet away and facing away from them and due to the safety feature mentioned in the article as well. For a professional walker or trainer that is able to hang onto the device, I think it is fine to use when you want the dog to have more freedom. But for most people, I still would not recommend it and instead suggest they use a safer alternative, a long line that can drag on the ground with them holding onto the end of it.